A 4' 6" x 3' Garden Chest made from shiplap cladding complete with a removable front and a lifting lid with lid stay. 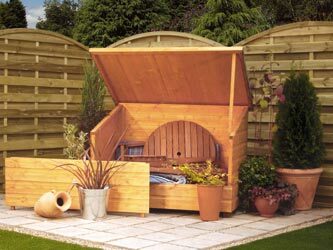 Supplied flat packed with easy to assemble instructions and supplied with mineral roofing felt. Pre-treated in a dipped honey brown finish.